Highland games are events held throughout the year in Scotland and other countries as a way of celebrating Scottish and Celtic culture and heritage, especially that of the Scottish Highlands. 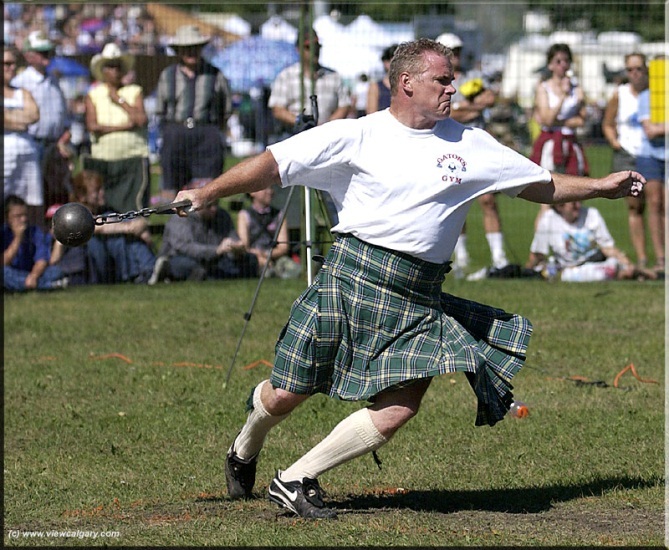 Certain aspects of the games are so well known as to have become emblematic of Scotland, such as the bagpipes, the kilt, and the heavy events, especially the caber toss. While centered on competitions in piping and drumming, dancing, and Scottish heavy athletics, the games also include entertainment and exhibits related to other aspects of Scottish and Gaelic culture. The modern Highland games are largely a Victorian invention, developed after the Highland Clearances. The Cowal Highland Gathering, (better known as the Cowal Games), held in Dunoon, Scotland every August, is the largest Highland games in Scotland, attracting around 3,500 competitors and somewhere in the region of 15-20,000 spectators from around the globe. Worldwide, however, it is dwarfed by two gatherings in the United States: the 50,000 that attend Grandfather Mountain in North Carolina and the even larger gathering -- the largest in the Northern Hemisphere -- that has taken place every year since 1865 hosted by the New Caledonian Club of San Francisco. 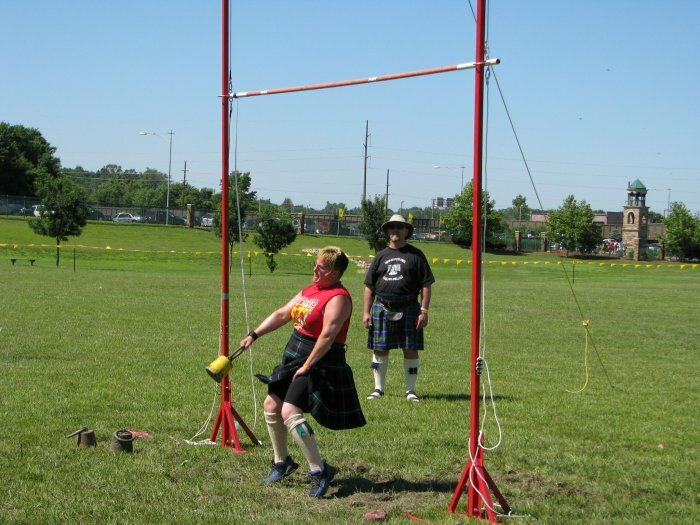 In their original form many centuries ago, Highland games revolved around athletic and sports competitions. Though other activities were always a part of the festivities, many today still consider Highland athletics to be what the games are all about — in short, that the athletics are the Games, and all the other activities are just entertainment. 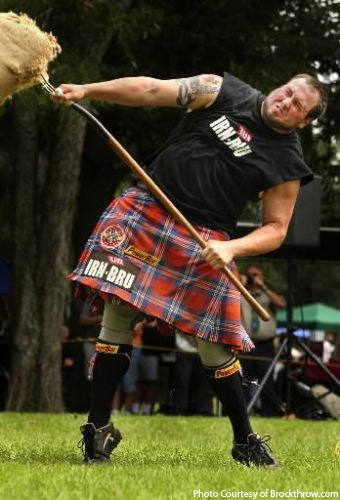 Regardless, it remains true today that the athletic competitions are at least an integral part of the events and one — the caber toss — has come to almost symbolize the Highland games. 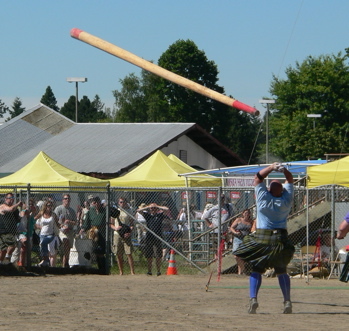 Caber toss: A long tapered pine pole or log is stood upright and hoisted by the competitor who balances it vertically holding the smaller end in his hands. Then the competitor runs forward attempting to toss it in such a way that it turns end over end with first, the upper (larger) end striking the ground and then the smaller end, originally held by the athlete, following through and in turn striking the ground in the 12 o'clock position measured relative to the direction of the run. If successful, the athlete is said to have turned the caber. Cabers vary greatly in length, weight, taper, and balance, all of which affect the degree of difficulty in making a successful toss. Competitors are judged on how closely their throws approximate the ideal 12 o'clock toss on an imaginary clock. Stone put: This event is similar to the modern-day shot put as seen in the Olympic Games. Instead of a steel shot, a large stone of variable weight is often used. There are also some differences from the Olympic shot put in allowable techniques. There are two versions of the stone toss events, differing in allowable technique. The "Braemar Stone" uses a 20–26 lb. stone for men (13–18 lb for women) and does not allow any run up to the toe board or "trig" to deliver the stone, i.e., it is a standing put. In the "Open Stone" using a 16–22 lb. stone for men (or 8–12 lb. for women), the thrower is allowed to use any throwing style so long as the stone is put with one hand with the stone resting cradled in the neck until the moment of release. Most athletes in the open stone event use either the "glide" or the "spin" techniques. 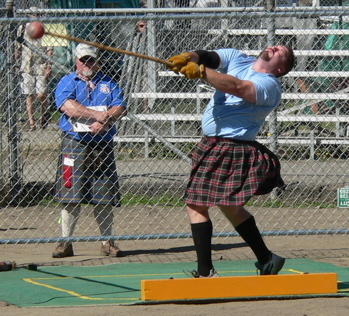 Scottish hammer throw: This event is similar to the hammer throw as seen in modern-day track and field competitions, though with some differences. In the Scottish event, a round metal ball (weighing 16 or 22 lb. for men or 12 or 16 lb. for women) is attached to the end of a shaft about 4 feet in length and made out of wood, bamboo, rattan, or plastic. With the feet in a fixed position, the hammer is whirled about one's head and thrown for distance over the shoulder. Hammer throwers sometimes employ specially designed footwear with flat blades to dig into the turf to maintain their balance and resist the centrifugal forces of the implement as it is whirled about the head. This substantially increases the distance attainable in the throw. Weight throw, also known as the weight for distance event. There are actually two separate events, one using a light (28 lb. for men and 14 lb. for women) and the other a heavy (56 lb. for men, 42 lb. for masters’ men, and 28 lb. for women) weight. The weights are made of metal and have a handle attached either directly or by means of a chain. The implement is thrown using one hand only, but otherwise using any technique. Usually a spinning technique is employed. The longest throw wins. Weight over the bar, also known as weight for height. The athletes attempt to toss a 56 pound (4 stone) weight with an attached handle over a horizontal bar using only one hand. Each athlete is allowed three attempts at each height. Successful clearance of the height allows the athlete to advance into the next round at a greater height. The competition is determined by the highest successful toss with fewest misses being used to break tie scores. Sheaf (not sheep) toss: A bundle of straw (the sheaf) weighing 20 pounds (9 kg) for the men and 10 pounds (4.5 kg) for the women and wrapped in a burlap bag is tossed vertically with a pitchfork over a raised bar much like that used in pole vaulting. The progression and scoring of this event is similar to the Weight over the Bar. There is significant debate among athletes as to whether the sheaf toss is in fact an authentic Highland event. Some argue it is actually a country fair event, but all agree that it is a great crowd pleaser. For many Highland games festival attendees, the most memorable of all the events at the games is the massing of the pipe bands. 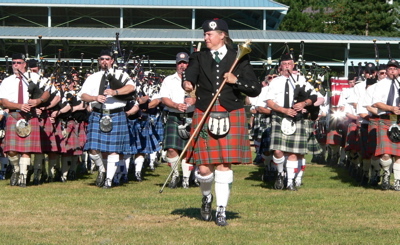 Normally held in conjunction with the opening and closing ceremonies of the games, as many as 20 or more pipe bands will march and play together. It is, in fact, the music of the bagpipe which has come to symbolize music at the Games and, indeed, in Scotland itself. In addition to the massed bands, nearly all Highland games gatherings feature a wide range of piping and drumming competition, including solo piping and drumming, small group ensembles and, of course, the pipe bands themselves. There are two basic forms of dancing at modern Highland Games gatherings. Scottish country dancing is a social dance like ballroom dancing or square dancing, the latter of which evolved from country dancing. The other type of dancing which one can see at Highland Games events is the highly competitive and technical form known as Highland dancing. This again takes two forms. First there are the traditional Highland dances - the Sword Dance (or Gillie Calum), the Highland Fling, the Highland Reel, and the Seann Triubhas (pronounced shawn trews). The other competition dances are known as national dances, the most well known of which are the Scottish Lilt, the Flora MacDonald, the Earl of Erroll, Highland Laddie, Blue Bonnets and Village Maid. Also common at the games are the Irish Jig and the Sailor's Hornpipe dances. 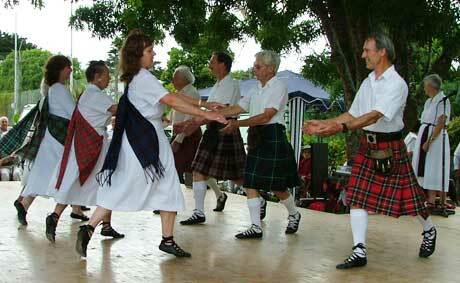 Historically, the Highland dances were danced only by men. This is most likely because men themselves came up with the dances. The Highland Fling was a dance that started out to imitate a courting stag on a hill, hence a man should dance it in order to court his lady. The magnificent Sword dance was in fact a victory dance that was accredited to King Malcolm himself. This came about as the result of the nature and origin of the dances themselves as well as the fact that during the years of Proscription, only military regiments were permitted to adopt Highland attire and practice the traditions such as dancing. But late in the 19th Century, a young woman named Jenny Douglas decided to enter a Highland dance competition. As this was not expressly forbidden, she was allowed to enter and since then, the number of females participating in the sport has increased until today in excess of 95% of all dancers are female. 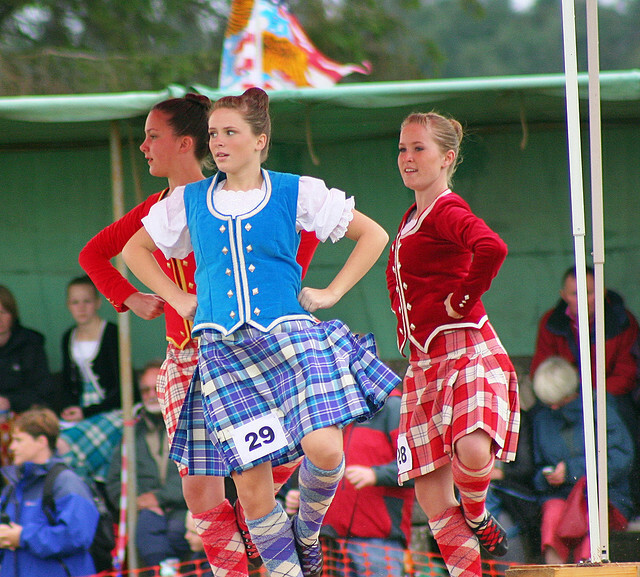 There have been several female World Highland Dance Champions crowned at the Cowal Gathering since they began organizing the competition in 1948. 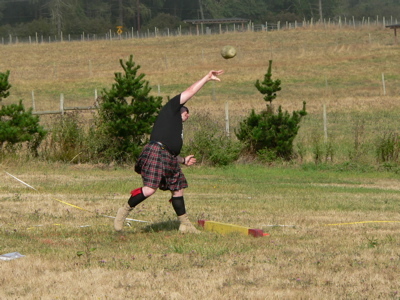 At modern-day Highland Games events, a wide variety of other activities and events are generally available. 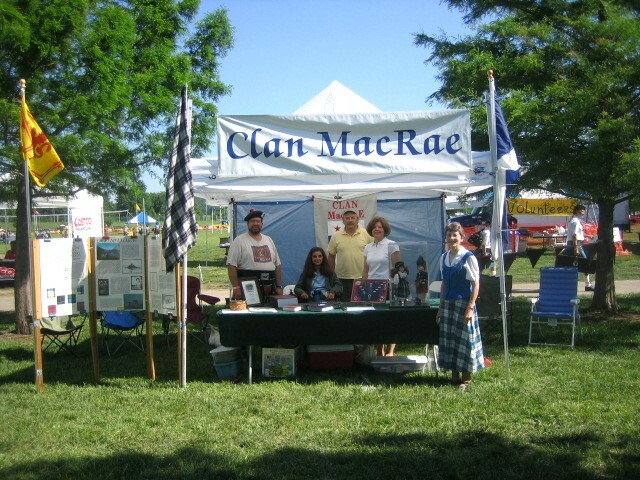 Foremost among these are the clan tents and vendors of Scottish related goods. The various clan societies make the Highland games one of the main focus of their seasonal activities, usually making an appearance at as many such events as possible. Visitors can find out information about the Scottish roots and can become active in their own clan society if they wish. 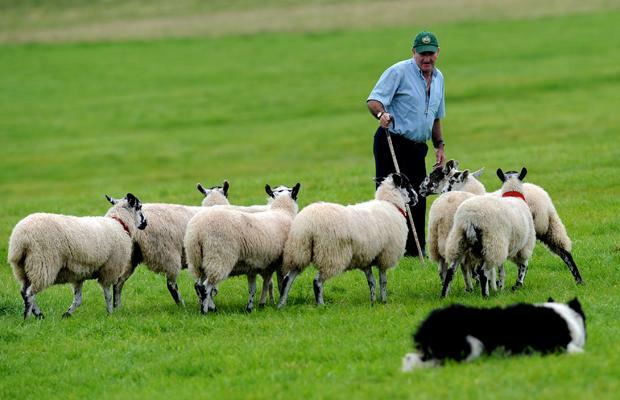 Herding dog trials and exhibitions are often held, showcasing the breeder's and trainer's skills.